The weather has been freakishly warm lately. While I'm not, technically, complaining, I am waiting for the reality check of an overnight plummet where we awaken to 28 degrees with a high temperature of 38 and wind, rain, sleet and snow. It's not spring completely yet. I remember snow over Memorial Day. Yet, I'll enjoy pleasure of serendipitous warmth. I opened the bedroom window this morning and was nearly run over. She doesn't come into the bedroom much, other than to 'yell' at me in the morning if the food dish is empty and I'm not moving fast enough to fill it. 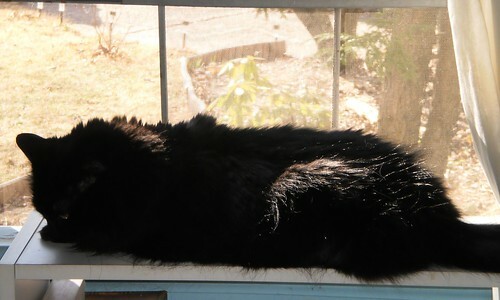 She plopped herself down in the sunshine and warm spring breeze coming through the window. Mija followed and got hissed at. She stayed there for about an hour and then followed me into the office where I'm working. Ah the joys of opening the house up after the winter. Man, I need to wash windows.